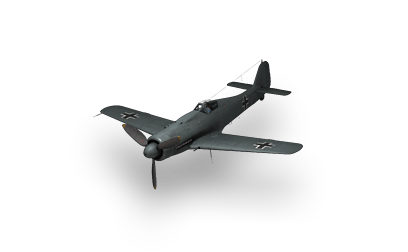 A further modification of the Fw 190 featuring heavier armament and a more powerful engine. Entered service in the spring of 1943. Used extensively as a multirole fighter. 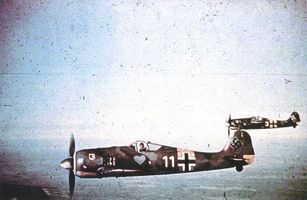 The Focke-Wulf FW 190 A-5 is the tier VI variant of the 190. This version plays very similar to the last. It keeps it's high altitude performance, as well as it's speed and acceleration. The two big things are the addition of rockets as well as more guns. The A-5 has a much better ground attack thanks to the addition of rockets. 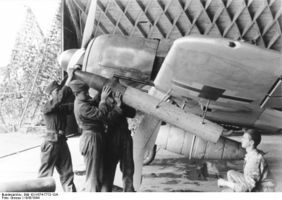 Just like the P-47, the rockets can be used at further range and in air as well. The second part is the heavier guns. These guns consist of two additional 20mm cannons which brings the total to four, and 13mm guns replacing the 8mm guns. The extra DPS will help shred heavy fighters and bombers, as well as anyone who head-ons with you. 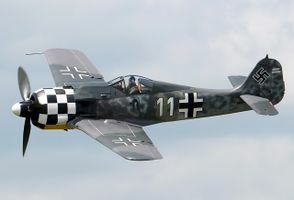 To play this aircraft, stick to higher altitudes and use your speed to catch bombers. Dive on ground targets to use ordinance. Avoid turn fights with fighters, as they will outmaneuver you. This aircraft leads to the next 190. This page was last modified on 7 July 2018, at 17:24.